Are Scottish school league tables demoralising for pupils? Unofficial school league tables are a staple of Scottish newspapers, many of which last week compiled a list of the "best-performing" based on Higher results. The Scottish government publishes raw data on exams but deliberately avoids league tables because they don't offer a wider picture of a school's performance. What do the pupils of schools near the bottom of the list think? Dawnmarie is an S6 pupil at St Paul's High in the Pollok area of Glasgow. It was ranked 316th out of the 339 state high schools in Scotland in a league table compiled by The Times. At St Paul's, 17% of pupils achieve five or more Highers compared to 83% at the number one school, Jordanhill. Dawnmarie told BBC Scotland's The Nine: "As children we are always told not to judge other people because it is a form of bullying. "I feel that is exactly what these league tables are doing to us. "It is judging all of us against other schools and it is really putting children down." St Paul's draws 89% of its pupils from areas which are among the country's most-deprived, the bottom fifth of the Scottish Index of Multiple Deprivation. Dawnmarie said: "I've seen on Twitter a teacher having to explain to her pupils about how they are not the worst school and how they all felt so demoralised. "I think that's how we all feel. It is demoralising. We are put down, it's not right. As children we should not have that pressure on us." Image caption Peter says teachers at St Paul's go "above and beyond"
Another St Paul's pupil Peter said the teachers at the school went "above and beyond" to help everyone achieve what they could. He said this extended to extra lessons on a Saturday, which were not as well attended as they should be. S6 pupil Brian also praised the dedication of the teachers, saying: "This school encourages you to go further and they will always offer you different alternatives." Mr Cairns said Lewis Capaldi might be number one in the charts with Someone You Loved but no-one above the age of eight would consider it to be the "best" song, based on that measure. Kirkcaldy High School in Fife was ranked 245th in the unofficial league table. S6 pupil Jack told The Nine: "We know it is a good school and there is a lot that the league table doesn't show." "A school is about much more than churning out exam results," said S4 pupil Cara. "It is important we leave here actually being decent people with skills for life." S5 pupil Jake said that many students did not take five Highers but instead passed courses that were equivalent but weren't counted in the league tables. Jake did a course called Hospitality Skills for Work. "I learned more in about six weeks down there at the college, working with the chefs, doing what I love, than I have in five years doing any course in school," he said. "Five Highers would not help me much to be a professional chef." She has done a two-year foundation apprenticeship in childcare. "If I had taken five Highers I would not have the experience to leave school and work with kids," she said. "But now I'm leaving school in S6 having had a year of experience working with children and I can just walk into a job as a pupil support assistant." Jack said: "A lot of workplaces say exams are important but it is also about experience." "It varies from person to person. For some, five Highers would suit them but for others it won't. "I think this school does a really good job of promoting the other options." Cara said: "I'm proud to be a pupil at Kirkcaldy High school and I don't think our school should be defined by where it sits in the league table." It is broadly accepted - by teachers, councils and the Scottish government - that there is much more to a school's performance than the raw exam results. In particular, there is a broad co-relation between exam results and a school's catchment area. That is why there are no official school league tables in Scotland, only unofficial ones produced by newspapers and based on passes at Higher. Broadly speaking, the schools which feature near the top of these tables are likely to be in prosperous suburbs. The reasons for this would seem superficially obvious. A greater number of children may come from comfortable family backgrounds where parents who are themselves highly-educated may be in a better position to help their children with their studies or even buy in extra tuition. Similarly fewer children will face disadvantages linked to poverty and deprivation. The argument is that to suggest these "top-performing" schools or the teachers who work in them are somehow "better" than others is simply misleading. Naturally though, some parents may feel more comfortable with the thought of sending their child to a school where a relatively large proportion of children get good exam results. They might make placing requests to these schools or even consciously buy a house in the catchment area. It is hard to conclusively prove that some property prices are higher simply because of a school's catchment area rather than because the area itself is desirable for a number of reasons. However an intelligent and thoughtful reading of exam results data or comparisons between schools facing similar challenges may provide food for thought. For instance - why might there be a significant difference in the performance of two schools with similar catchment areas? Might a school serving a prosperous area actually be coasting? Or might another still be doing exceptionally well? Similarly, might a school serving a challenging or disadvantaged area be making big strides forward and punching above its weight? Perhaps the numbers getting at least one Higher or the numbers getting five Highers or going to university has gone up significantly. 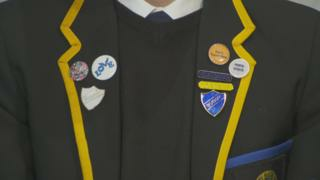 Parents and students may wish to consult inspectors' reports published by Education Scotland to get a sense of a school's strengths and weaknesses.